The disconnect between the time of use and the time of payment is sometimes blamed for the little awareness that many consumers appear to have about their usage of electricity. Real time information feedback combined with various pricing schemes has been found to reduce residential energy consumption more than information and pricing policies alone. I examine the effect of information provision with bi-monthly billing, monthly billing, and in-home displays in addition to a time-of-use pricing scheme on consumption over each month of the Irish Consumer Behavior Trial. I find that time-of-use pricing with real time usage information reduces electricity usage up to 8.7 percent during peak times at the start of the trial but the effect becomes indistinguishable from other treatment groups after the first three months. Increasing billing reports to the monthly level or a web application providing real time information may be more cost effective than in-home displays. Proceedings - Information feedback effects in retail electricity markets. Proceedings - Peak demand and time-of-use pricing in a field study of residential electricity demand in Germany. 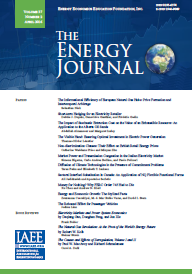 Published in Volume 38, Number 6 of The Quarterly Journal of the IAEE's Energy Economics Education Foundation.